I was with Zell until this decision. Print design is the least of newspapers' concerns right now. It's not a major factor (it's not a factor at all, honestly) in why I don't read the print edition very often. I simply want something more modern and immediate. That's what the Web offers me. Instead of blowing money on a redesign that many people may not like, Zell and his team should spend money and reinventing the Tribune's Web operations. I've got news for Zell, Tribune has pretty weak Web properties. That's the real issue. This idea of radical redesigns will do nothing to address the fundamental issue with Tribune's properties, while simultaneously alienating a lot of long-time subscribers. Brilliant. Is it just me, or does the paper look like a web page. That can't be good. Well, I'm going to differ with all y'all, as my southern neighbors would put it. I actually like the proposed design, but I don't think it matters all that much because of two issues that I think are larger, and neither has much to do with the Internet. One issue is that content is way more important than presentation, and I can't tell from a page design whether there's an honest plan in the works to recast the entire journalism process of these newspapers so that they're full of content that demands my attention for 30 minutes a day, and kill absolutely everything else. Such a move might surprise me and breathe life into a product form that I think is dying. The other issue is that audience fragmentation demands product fragmentation. That means it's far more important for the Sentinel and the Courant and yes, the Tribune to deploy a family of products that are targeted at demo/lifestyle/geo/interest segments than it is to tinker with the big daily general report. The metro paper is going to die. Figure out what you're going to do to replace it, because the increasingly diverse audience still has interests and needs, which present opportunities. This is not a matter of print versus online, but rather content and services that don't align well with the realities of the marketplace. I know there's long been a belief that radical newspaper designs exacerbate problems rather than solving them. I think it's more accurate to say that American newspapers (and this is a peculiarly American trait) cling to outmoded designs and product formulas until it's too late. It was too late for the Daily News when Peter Palozzo turned the funereal column rules, and it's probably too late for half of America's metro dailies. Anyone who's been following recent work by Mario Garcia will see some Garcia family traits in the prototype Orlando front page. Actually, I don't find it as radical a remake as I heard it might be. My issue is the content: where is the news? I hate question marks in stories: Are You Having a Stroke?" because my answer as a reader is no, I am not. So why should I read this particular story. Ax Falls at UF I guess means cutbacks at the University of Florida, but the art is of brick institutional walls, not of people having an emotional reaction to losing their jobs. I can't read the stories, but I would guess Busting Bullies would involve kids being bullied at school. So there's front page strokes for old people, front page sports feature for male readers, kids being bullied for women readers, a fact box on something I don't recognize and the main story being cutbacks at UF. One news story on the front page? But wait, is that what looks like an an ad on the bottom right hand side? Why, yes, it certainly looks like ads on the front page is part of the recipe Zell prescribes for his papers. But were is the content, and where is the news? It's a shame that newspapers haven't considered better content - in print and on the Web - as a possible solution to declining reader interest. Design is one of the three primary languages -- along with words and images (still or moving). Living on top of the Mason Dixon line as I do, I could change my slightly southern accent to make a better first impression on my northern neighbors. But after a little conversation, they'd know I'm not a yankee. It's the content! And it's matching content mix to the media and to the customers' lives. I see similar content ideas -- good ones -- in both designs. Zellando is kinda klunky -- little variation in emphasis and a bad color palette -- but it shows the same awareness of what really matters to people and to emphasizing the kind of story-telling that works well in print. But, to disagree with the comment about Zellando looking more like a web page than Orlando, I don't think either of them looks like a page produced by people who have reached into a deep, broad web site and pulled out some interesting topics for a nice, extended print read. The print design challenge of the 21st Century is to look like a savvy print extension of a fabulous web site. Alan, you said in an earlier post that Zell doesn't have a plan. If this design tweaking is any indication, he also doesn't have a clue. Here's a side-by-side of the prototype with the page that actually printed. Same stories - different format. They laid off good reporters for this? The cartoons on the bullies story are plain silly, and the art with the UF story is generic photo file stuff, and it looks it. The huge graphics are distracting and unnecessary. And look what was lost in the makeover: a brief story on Myanmar struggling, and the piece on a local transit issue. I do find the "how she stole the baby story" tick tock is better presented in the Zellando version. Fold it in half and put it in a newsbox and it looks very busy and somewhat intimidating. Content, not graphics, have to be king or we are all lost. Maybe the Zell monkeys were reading this paper. "While there are few absolute rules in the wild-and-crazy realm of marketing, one of them, to paraphrase Hippocrates, is to do no harm." Um... no. It is absurd to draw this parallel between marketing and medicine. Marketing is about getting your attention, putting a fresh spin on things, and selling product. While it's too early to tell if this redesign will sell product, it seems likely to succeed at the 'getting your attention' and the 'putting a fresh spin on things' aspects. I'm underwhelmed. The re-design will neither cause existing readers to cancel their subscriptions, nor will it attract any new readers. The re-design really isn't that radical. It's just irrelevant. Journalism is about gathering and delivering relevant information and insightful interpretation. This whole effort is about distributing a fancy new patter of ink-soaked paper. Maybe their next project should be designing a more crowd-pleasing horseshoe? One thing to keep in mind while studying the prototype is that it is a prototype: They had weeks, maybe longer, to come up with this one front page. How are they going to pull this off on a day-to-day basis? For the prototype, they obviously chose stories that worked will with their "vision." The daily news budget may not be so friendly. What a half-reared blog post. First of all, you've made no attempt to explain what the design staff of the Sentinel has in mind with this redesign. You're just spouting off, Newsosaur. Second, there's no mention of the change in the storytelling process that will accompany the redesign. This is somewhat as a result of the above point, that you didn't contact the Sentinel for comment. Third, keep in mind that these are mockups. And in fact, they were hastily prepared in some regard -- the daily process of consulting with metro editors, photo editors and reporters as the stories took shape was not part of the exercise. Fourth, if you think Sam Zell was in Orlando contributing to this, you're high. Fifth, Orlando in 2008 is not Chicago in the '70s. And, whereas it sounds like that afternoon paper was just doing different things for the sake of being different in order to beat two well-established competitors, the Sentinel is taking some lessons learned from a competing format and from observing readers' changing habits, and applying them to a potential evolution of its product. Might work. Might flop. Gotta try something in an educated fashion, though, because the same-ol-same-ol is not working anywhere in this industry. Orlando's planned blend of ASF and read pieces should reach out to readers who want quick-hit explanations of detailed stories (ASF is so underused in this industry, it's frightening) without losing people who want ti sit down and dig into something with emotion. Print journalists should be rooting for experiments to succeed -- so they can be broadly copied and used to save hundreds of papers -- not taking potshots at every idea that comes along. That's what's killing the format. Wish the Sentinel luck. It's your brother. I do hope Orlando and all the others succeed. That's why I write this stuff. The comparison posted by 9:10am is much starker than the one in the original post. One thing that struck me: The non-prototype page was ugly. The Kansas City Star did a similar redesign a few years ago. When I visited the city and read the paper as a reader rather than a journalist, I found it much easier and more inviting than the scheme it replaced. If Orlando et al. execute well, this redesign will help more than hurt. I've worked for Tribune for several years now and each time management requires a shakeup, they turn to print designers to come up with something "new and fresh." Take the Baltimore Sun: with great fanfare a few years ago, they introduced the "hot L" to the front page, after spending a LOT of money ($1 million plus, i think) on redesigning the look -- money that instead should've been spent on its clunky Website. So what did it mean? more dizzying photo/graphic mashups on the front page -- and negligible impact on readership growth. during this same period, the number of content-producers (editors, copy editors and reporters) has shrunk considerably. At first, I was excited by the Zell Junta and the enthusiasm for change they brought to Tribune. The Fitzsimons crowd just buried us in bureaucracy. But for the most part now, Zell & Co. continue to seem to pour the bulk of their energies into reshaping the daily print report. meanwhile, i agree with another poster's comments on this thread: Tribune's web properties are absolutely abysmal, cluttered, poorly organized and -- for the most part -- boring and gimmicky. They lack the attention to user-friendly design and there doesn't seem to be enough creative minds connected to Tribune's web properties to make these sites "next-generation." Most ugly newspapers are still designed better for user-interaction than Tribune websites are today. Don't pay much attention to Bonita. She really has no idea about what the readers want. 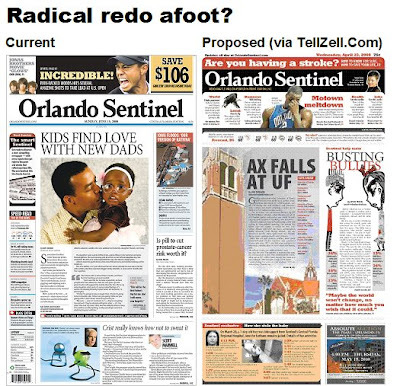 One look at the prototypes proves that: A headline of "AX FALLS AT UF" sits next to towering buildings. Can we say conflict between text and visuals? Just wait a few months, and this bunch will be wringing its hands and preparing for yet another redesign. She talks about comments being "insulting" to her staff, but every pointless word out of her mouth is an insult to intelligence everywhere. Plain and simple: This is dumbing down the news. Big time. It makes no sense, and readers shouldn't have to suffer through it. What crack pipe are you and the people in Orlando smoking? PRINT design has nothing to do with the problems facing the industry right now. The Sentinel, like most American newspapers, doesn't have a strong enough Web presence. The fundamental product needs to change. In fact, the real issue is that there is a complete lack of synergy between print and Web at most newspapers. Why are the same stories going in different mediums? That makes no sense. That's the real issue. I'm 23. Design has nothing to do with why I rarely read a newspaper (I get the Sunday Post and that's it). It's the content. The content is just not there, especially in the formats that I want it in. I work for a newspaper, and I'm not rooting for this to succeed, because I can guarantee it won't. Nothing against the Sentinel or Tribune (I once worked at the Trib), but this is not what is going to turn this company around. This is one of the stupidest ideas I have ever heard. It's 2008. A print redesign? Get real. I never thought I'd agree with Pat Thornton, but now it's happening. I also am rooting for this to fail. And I'd like to guarantee it will. But it needs to fail to the extent that no one ever tries this stuff again. It needs to fail so badly that the design camps are forced into an exodus from the newsrooms. Pat...at 23, you have all the answers? Get real. Rooting for something to fail shows your ignorance and complete disregard to what still makes newspaper companies money: print. yes, the online model needs to be improved. but, in the meantime, the print product needs to keep enough people employed to help make that happen. I had the same reaction -- looks a lot like the KC Star, which I also find enjoyable and attractive. But it's hard for me to get worked up about a redesign. It's probably rearranging deck chairs at this point. Pat is often wrong (and badly so), but in this case, he's right. It's not "ignorant" to hope for this to fail. It might be the best way to finally get the designers and the pseudoeditors out of the newsrooms, and maybe newspapers can be respected sources of info again, instead of dumbed-down rags that do nothing to attract and keep readers. The covers of "the book" were posted today, and outside of the NASA article and a couple feature stories, there's very little news value to this paper.